S&S Home Health has carried Golden Technologies lift chairs for more than 25 years now and has been able to stand behind every warranty, completely worry-free. All of the lift chairs we sell are proudly Made In America and offer a large selection of sizes, styles and features. The VALUE SERIES consists of five very well appointed models available at an affordable price. The COMFORTER SERIES boasts lift chairs sized to fit anyone, with sizes ranging from Jr. Petite through Super 33, which can accommodate individuals up to 700 pounds. The TRADITIONAL SERIES offers the popular Williamsburg Wingback, the Cambridge with its overstuffed back and the Pioneerwith its rich wood armrests. 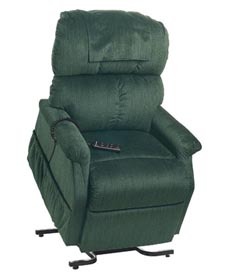 The MAXI-COMFORT, the newest line, lift, recline and, with the help of a second motor, let you experience the Trendelenburg position, where the body lies flat with the feet raised higher than the head—an optimal position for sleeping or watching television. The SIGNATURE SERIES offers waterfall backs and armrests that contain a folding tray table in one and spacious storage space in the other. For smaller spaces try the Space Saver, which requires only six-inches of space to fully recline! Golden Technologies builds every lift chair using state-of-the-art fabrics and materials (many with built-in stain blockers) and offers a wonderful selection of colors and custom fabrics, including suede, bronco and brisa—the softest, most durable material available. S&S Home Health also carries Pride and Action model lift chairs. S&S Home Health services EVERY brand we sell, as well as most other commercially available brands and models of lift chairs.